“The expanded RX65N/RX651 devices support security and reprogrammability needs, offering integrated enhanced flash protection, and other technology to create a secure and stable integrated solution, as proven by the Cryptographic Algorithm Validation [CAVP] certification,” said the firm. For human-machine interface, the two ranges include a TFT controller and 2D graphic acceleration. “Selecting a WQVGA display allows the 640kbyte of on-chip RAM to be used as display frame buffer, which saves external RAM,” said Renesas. The RXv2 core and 40nm process allow 4.55 Core Mark/MHz performance. Dual bank flash is included to support in-the-field firmware updates. There is a board support package, which controls the common information for functions like initial MCU, clock, and board settings, and “the new Envision Kit provides an evaluation environment that allows engineers to benchmark MCU performance and start developing their own software,” said Renesas. 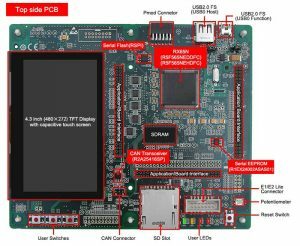 The RX65N starter kit includes a development board with MCU, display, on-chip debugger, trial C compiler and integrated development environment.